Johan Fynbo appointed professor of astrophysics at Dark Cosmology Centre at the Niels Bohr Institute. The Professorship is with special responsibilities (MSO) and is connected with Johan Fynbo’s ERC project about galaxies in the early universe. In the research project, he is working with observations from the first galaxies that formed after the Big Bang – from the first small accumulations that slowly collapsed due to gravity and then formed larger structures. This process is heavily dependent on a dominant, but unknown form of matter – dark matter. Johan Fynbo is particularly interested in exploring these early galaxies with a wide range of independent methods in order to get a more complete picture of the galaxies that existed the first billion years after the Big Bang. 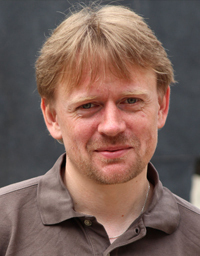 Johan Fynbo received an MSc in mathematics and physics from Aarhus University in 1996. He then began his PhD studies, conducted primarily in Aarhus, but also at the Space Telescope Science Institute in Baltimore and a year at ESO in Germany. After receiving his PhD in April 2000, he worked an additional two years at ESO in Germany and then two years at Aarhus University on a Carlsberg grant. In 2004 he was appointed Associate Professor at the Niels Bohr Institute. He is also an excellent teacher and adviser and in 2010 received the Teacher of the Year award at the Niels Bohr Institute. He currently has five PhD students.